Defining an Objective (or) Plan is the key for executing (or) achieving the desired output. As in DMAIC, DMADV also starts with Define phase. Not only in Six Sigma, but almost all projects begin with defining the objective / plan (ex. PDCA). The role of the Define Phase is very critical in a project, as it can change the entire course or outcome of the project. So, it is very important to be precise and accurate in defining the project goal, scope and the exceptions. Also a first-hand study and observation of the process/product under purview is necessary. In case redesigning is planned (for an existing product/process); this firsthand observation will provide several clues and ideas that will help the project leader to estimate the benefits and outcome in a real-time basis. 1. Prepare a strong case on why the DMADV is required and get the consent of all the stakeholders concerned. 2. Identify the core team members. 3. Identify and define the process that should be re-designed, for the benefit of the team members. This will help them to align themselves to the CTQs and design aspects and will set the expectations for them. 5. Decide on the type of sampling and sample size which will be required. 6. Collect the VOC, VOE, and VOB and collate all the customer/business requirements. This will provide us with a list of CTQs (Critical to Quality) that the process should be designed for. 2) Delighters (Customers would be pleased to have): These are the features, which are considered value add for the product. The absence of these features, do not leave customers dissatisfied but, their presence delight them. These features are the differentiators from the competitors. 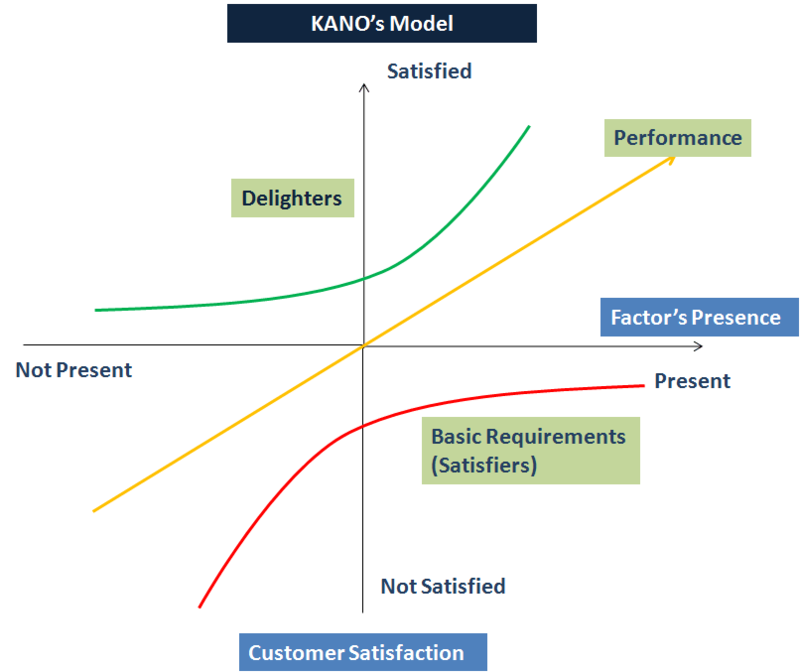 KANO model is one of the best ways to identify and prioritize the customer requirements, design your product and to take a stand on how to position your product against the competitors. It also helps in identifying the CTQs that go along with the product positioning. To be more precise, a company that wants to be a pioneer or market leader should choose to innovate and introduce more “Delighters”. Assume a Telecom service provider wants to re-design their complaint resolution process that they already have. Currently the accuracy percentage of complaint resolution is 90%. But the customer satisfaction survey indicates that the customer satisfaction % of customers with complaints is consistently lower (65%) than the customers with other segments (80%). After some more analysis the company’s six sigma team concludes that a normal DMAIC project may not provide the necessary leap to improve the Customer satisfaction. And the Complaint resolution process has to be redesigned or remodeled in order to meet the target. The goal of the project will be: To (re)design the complaint resolution process that will have a satisfaction rate of 75%. The six sigma team decides to use the following instruments to capture the CTQs. 2. Interview a selective list of customers who have placed complaints. 3. Interview few employees who interact with customers (attend the calls of the customers with complaints), to understand the requirements from the customers. 6. Conduct a survey, with a detailed questionnaire asking them how they would expect an ideal complaint resolution. The above table is just an example and not an exhaustive list of the VOC. Unlike DMAIC, DMADV should focus on every single VOC, VOB and VOE. Care should be taken to identify and list down every minute requirement or feature that is expected. This is because the Design of the product/process should cater to every requirement of the customers. A Questionnaire was designed with statements (given below) and customers were asked to order their requirements with 1 being the highest priority and 10 being the lowest. I do not want to call more than twice for following up a complaint for resolution. I do not want the status of my complaint to be shared with anyone else other than me. I do not to share my bank account number and bank statement through email. Then the project team collated the ratings provided by the customers. The prioritization of the features was based on the sum of count (or percentage) of responses received against each statement. Now, we have seen how a DMADV Project is defined, and how the requirements are identified and prioritized. The next steps are how these VOCs & requirements convert into measureable CTQs and how it is measured. These will be covered in the MEASURE phase.